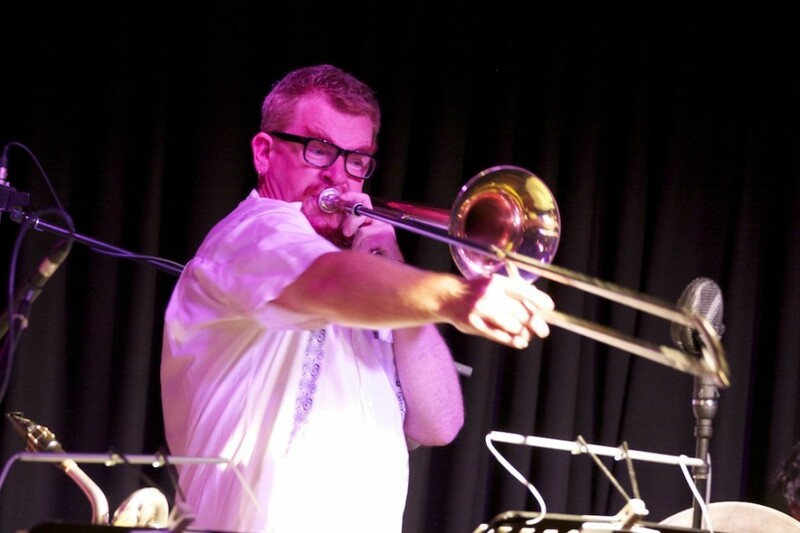 Jim Moginie is perhaps best known as a member of iconic Australian band, Midnight Oil. His musicality and vision helped shape the sound of the Oils – taking them far from their early pub rock thunder into a highly original and sophisticated soundworld, incorporating avant-garde elements side-by-side with jangling guitar Pop-classicism. It is this same head-in-the-stars/feet-on-the-dancefloor (or maybe in the Maroubra surf) that informs his recent performance The Colour Wheel. 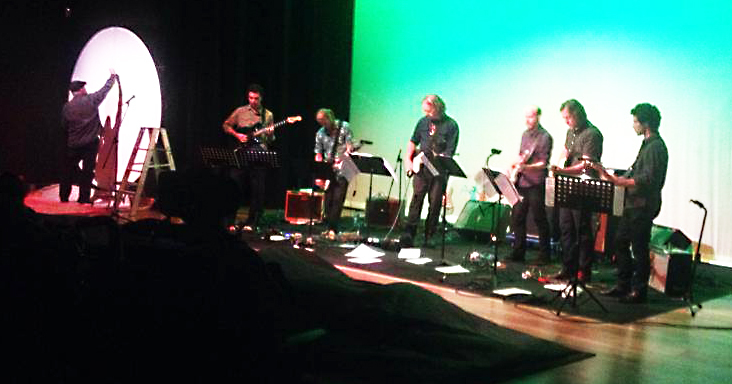 Performed at The Campbelltown Arts Centre, the work was commissioned by The CAC as part of the Aurora Festival of Living Music. Moginie’s ensemble of six electric guitars played through his suite of tone poems –­ each inducing a particular colour or hue – while the painters coloured in segments of a huge circular panel until they had completed a colour wheel (a kind of circular rainbow designed to show art students the relationships between colours… and a beautiful thing in itself). Moginie’s spoken introduction explained the seed of the idea – the revolutionary concepts of the early 20th century which sought to find linking structures between visual arts and music. Paul Klee, Kandinsky as well as Australian pedagogue Roy de Maistre developed theories on these links that fed back into their art with astonishing results. And this is what The Colour Wheel was to attempt to do over the next hour or so. 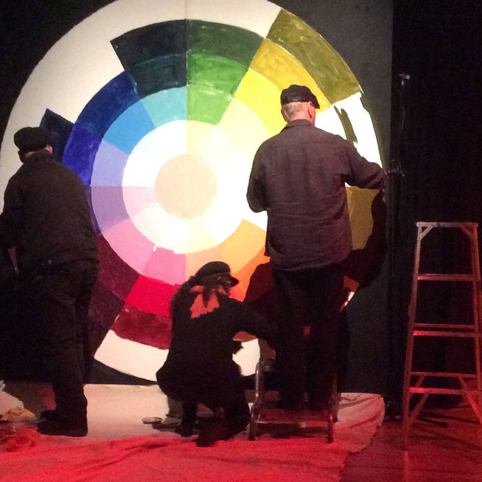 The tone poems brilliantly conjured each colour as the painters blocked in the corresponding hue on the Wheel. The musical pieces went from the obvious to the conceptually opaque. 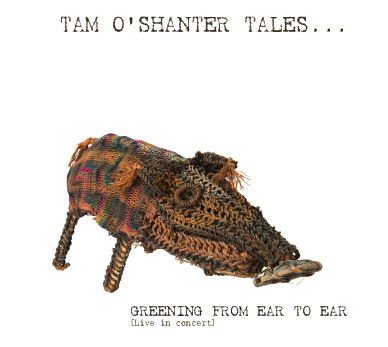 Red was gnashing discord and flaming shards of guitar; Yellow, sunshine pop; Green, a rural country ramble. 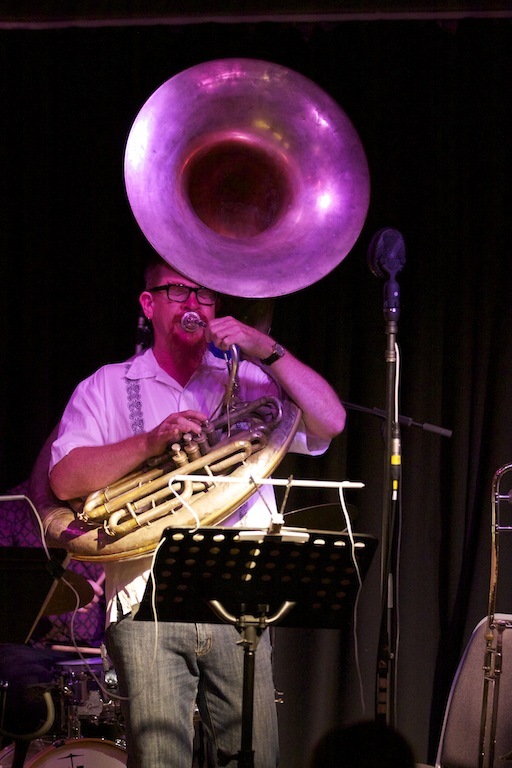 It was during the pieces that attempted to sonically ‘paint’ the in-between tones and hues where it got really interesting – and showed Jim Moginie’s smarts and wonderfully balanced ensemble writing. Turquoise, neither green nor blue, had a faintly Arabic feel, conjuring Phrygian minarets but not only that, new pictures too; Orange was equally miasmic, burnt and warm, but alien; Purple/Mauve was whole new thing, dense with a language that was new, a language that had wine on its breath, a new wine. The ensemble ­– two clean guitars, a baritone, a bass, a distortion guitar and an atmosphere guitar ­– worked with barely any effects apart from distortion and reverb, exploring the chiming tones of the instruments themselves. Moginie explained he was taking the role of ‘surf guitar’ (these days he plays with surf-artniks, The Break) and it was his glorious Fender Jaguar tone that led the pieces, nostalgic but Now, here airily bell-like, there roaring strange blues. 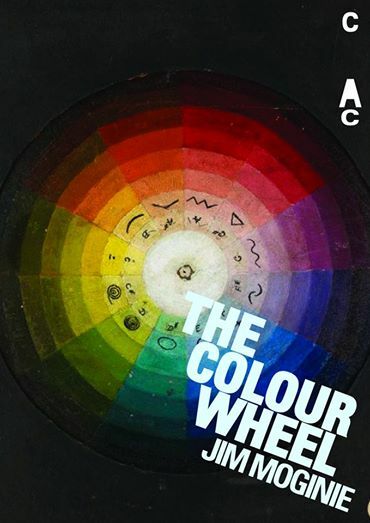 The Colour Wheel set out to explore the connection between colour and music and achieved it beautifully, giving the audience a spiritual thrill ride based upon the wonder of being human and the miracle of our senses. By the end of it all, we could ‘see’ sounds and ‘hear’ colours – something synesthetes have known for centuries. Synesthesia is, of course, the neurological phenomenon whereby one ‘sees’ (or hears) colours in music. Moginie’s 6-guitar ‘orchestra’ and three artists made us all synesthetes for a short while that rainy afternoon.